The simplicity and charm of this necklace makes it an everyday favorite. The choker features a delicate heart shaped genuine, created of simulated gemstone linked to a rolo chain. Crafted of fine sterling silver this necklace has a 3-inch extender and fastens with a classic spring ring clasp. The simplicity and charm of this necklace makes it an everyday favorite. 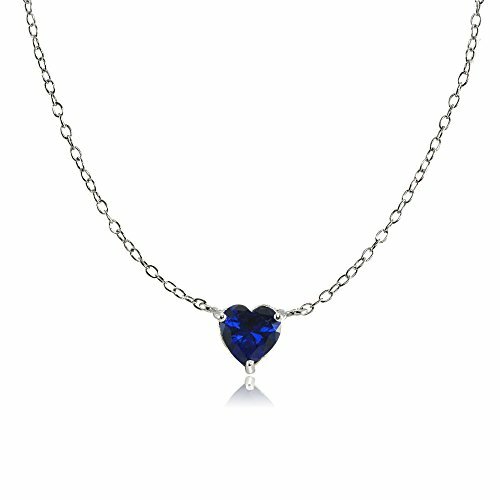 The choker features a delicate heart shaped created blue sapphire gemstone linked to a rolo chain. Crafted of sterling silver this necklace has a 3" extender and fastens with a classic spring ring clasp.